Interested in MISTI? Intern, teach and research across the globe. 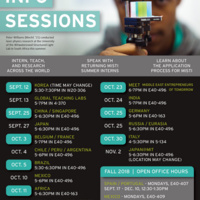 Start the conversation at the MISTI program-specific info sessions Sept 12 - Dec 10 and open office hours. Sign up for email updates at mist.mit.edu/hello.